risual are a dedicated, UK based, globally recognised IT Services organisation. Delivering business aligned consultancy, solutions & services based solely on the Microsoft platform. 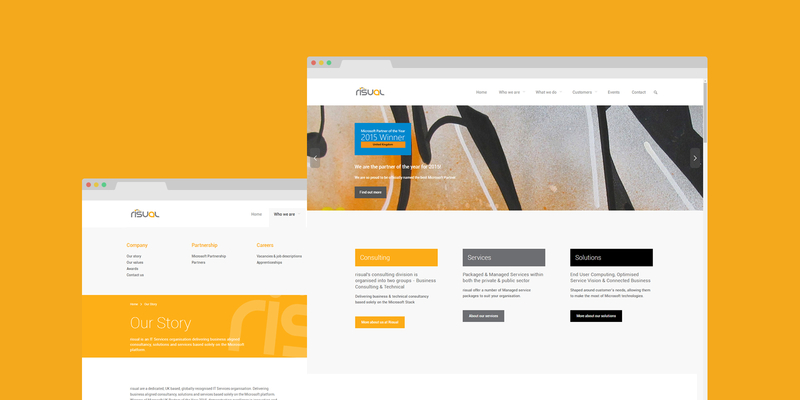 They've recently become Winners of Microsoft UK Partner of the Year 2015.
risual wanted something a little different when it came to their SharePoint intranet, they required a design that wasn't like the conventional intranets we all know. They wanted something that was fresh, creative & original. 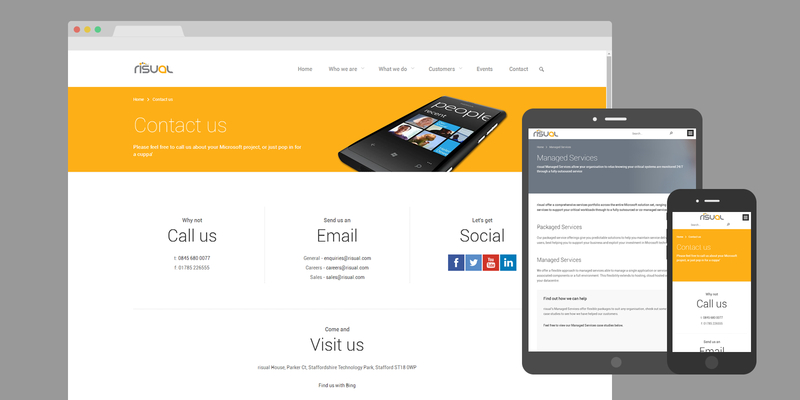 Not only did we deliver that we also took this requirement to their Office 356 website where we produced an innovative navigation UI, subtle animation & crisp imagery all developed into a responsive design enabling that experience to be taken to mobile & tablet . We held a brand workshops with their marketing department where we discussed the risual brand, tone and company voice. Establishing this at the start enabled us to create the right look and feel for the new company website. Next we ran a range of wire framing workshops where we looked at the content that was required, the importance of this content and where best it would be situated on pages so that audience could consume that as quick as possible. We produced a series of design concepts that encapsulated all their content requirements and brand. These were feed back to marketing for feedback and comments. A series of iterations were made until the design was finalised. Once the design concept was done, we felt it was important to show how the site would work, functional and what the entire user experience would be for users once they visit. We show cased the functionality to marketing for comments and feedback. We integrated a range of different types of functionality such as a drop down/mega menu type navigation, animations elements and fed social media feeds into site for Twitter etc. We also added a range of UI improvements to links and particular around the search experience. We create a brand new Masterpage and a range of Page Layouts to facilitate the different content types. We then build a range of CSS styles to brand the website and enable different user experiences based on the platform you were viewing such as phone, tablet or desktop. risual has used to website to help grow the business, win awards and more importantly help their clients get the best out of the technology they work with. The new design has been targeted as IT professionals and Microsoft focused companies who are looking to work with risual. We have produced a design that is clean, crips, professional and friendly which offers something a little different from a UI and UX point of view.